Before learning how to draw hair: some fun facts before starting sketching! A person will have an average of 160 000 hairs on the head. A hair will grow from 0.2 to 0.4 millimeters every day. A human hair is very strong. Some believe it can hang close to 5 pounds. Others think it can hang at least 900 pounds. Learning how to draw nice hair is a very good challenge for anyone. Long curly hair (3) can be more difficult to draw than straight hair (1). You have to consider the texture, the color and the highlight (4). A girl with long hair will usually be easier to draw especially if it's loose. Short hair might be more difficult since the haircut is more precise, more define. Drawing good looking hair is really a matter of learning how to represent this part of the human body with a minimum of lines to give the maximum effect. You have to carefully select which line you will use to draw the hair and which one you should NOT take. Take a good look at this picture and try to see how the movement is created with only a couple of lines. Ok... let's try to draw some nice long blonde hair. Start by sketching the head of your subject. Then, draw the outline of the hair. Next, add some lines to give more volume to the hair. Notice how the lines are drawn to give a sense of movement to the hair. Finish your artwork by adding colors. Try to use two or three different color tones for better results. You can always draw a simple head like this one (2) if you don't want to spend too much time drawing some hair. You can draw hair with only a couple of lines (6), a little bit more (1) or many many lines (3). 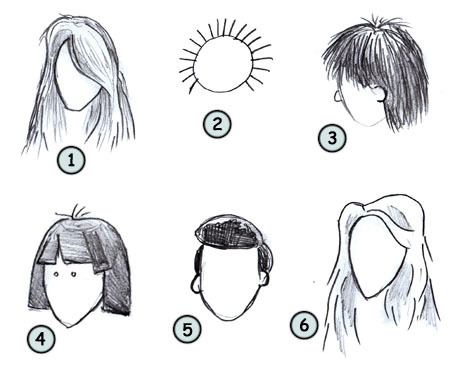 You can also draw some good looking hair using only one or two shapes (5). Happy drawing!